I’ve seen the heel-less shoes but how about sole-less heels? I seriously can’t help but think that these shoes are not functional and really quite ugly. They look like leg braces for sprained ankles with black tape wrapped all over. 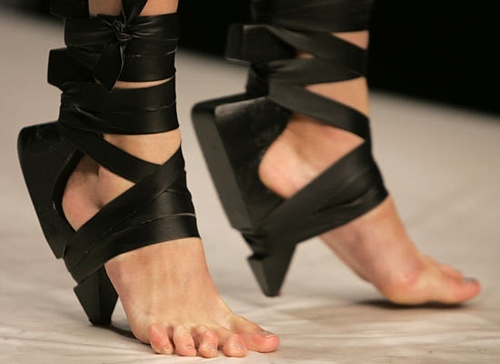 The shoes debuted as part of the London Fashion Week Spring 09 Collections… and I don’t see these being trendy at all unless you want a pair of nasty feet! Pretty silly overall.